A huge gay scene, fabulous sandy beaches and stunning historical sights make Barcelona one of Europe’s most popular gay destinations. 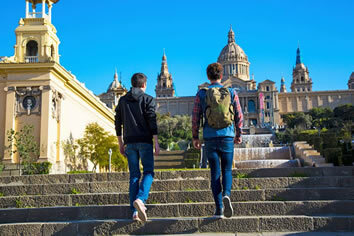 Barcelona enjoys an open and liberal gay life, it has a vibrant gay scene with many clubs, afters, bars, restaurants, throughout the city, especially around L'Eixample and Gràcia, the area is even known as the 'Gayxample'. Barcelona boasts a cosmopolitan and welcoming environment for all types of travelers from every corner of the globe. Barcelona is one of those cities that has so much to offer, you can never see it all. 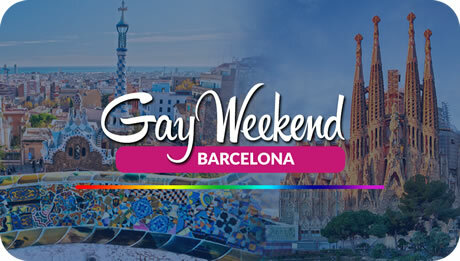 Experience the Best of Barcelona with our Special Barcelona Gay Weekend Package! • Arriving to Barcelona International Airport. Barcelona is a popular destination for partygoers with a vibrant bar and club scene. We will start the evening picking you up at your hotel/apartment, and after that we will head to the most popular bars located in the district known as Gayxample, where you will find a variety of gay pubs and bars. When the tour ends, around 1am, welcome to the Spanish culture, we will give you the last recommendations if you want to go to the newest and hottest clubs or the lifelong ones, because Barcelona has been offering the most exciting gay nightlife for more than 25 years. Avoid the inconveniences of not knowing where to go, getting lost in the streets or constantly asking for directions. With us the fun is guaranteed! With this 2 and a half hour tour, you will be able to enjoy the most renowned modernist houses of the city, such as La Pedrera, Casa Batlló, Casa Amatller and Casa Lleó i Morera. After that, we will dive into the streets of the Eixample district and discover other less well-known but equally spectacular architectural gems like the Casa Calvet, Casa de les Punxes or Casa Macaya. The tour makes headway in the Sagrada Familia, a church that has been in construction for over 100 years, where you will be able to marvel at the meticulously and richly decorated exterior which portrays many biblical scenes and emphasizes Gaudi’s deeply religious nature. This is one of Barcelona’s most iconic landmarks, and it will leave you speechless. When we finish the tour you will be able to go inside the Sagrada Familia on your own and stay there as much as you want. Although Barcelona is well known for its modern architecture, it has a history that stretches back 2.000 years to the Roman period with its heartland in what is known as the Gothic Quarter. After you have been picked up from your hotel, you will visit the Arco de Triunfo and the Ciutadella Park, where you will find the Castle of the Three Dragons, the Zoo, the Catalonian Parliament and a spectacular waterfall, among other things. This was the legacy of the 1888 Barcelona Universal Exposition. Afterwards, you will visit the ancient Gothic Quarter where in every alleyway you walk through, you will discover something spectacular, like the Cathedral, the Roman walls or the Jewish Quarter. • End of your FANTASTIC weekend in Barcelona and private transfer to the Airport. NOTE: This tour package can be fully customizable to fit your travel plan. • Soft drinks during the tours, a city map and gay map that shows all the gay friendly places in the city and some other surprises. Note: Monuments will be seen from outside except the Sagrada Familia, the inside will be visited by the travelers without the tour guide. Faithful to the concept and style of Axel-design, comfortable, cosmopolitan atmosphere and good value for price. The 105 rooms combine the touch of decoration from Modernism with the warmth and elegance of the Mediterranean. The area around the Axel Gay Hotel Barcelona is known as the Gayxample because of its lively gay scene. The staff has knowledge of the local gay scene, and the hotel is hetero-friendly too. 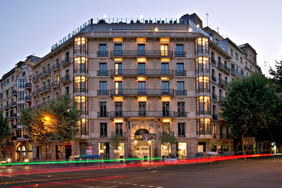 The Axel Hotel Barcelona & Urban Spa offers easy access to the Ramblas, the Picasso Museum and Gothic Quarter. The hotel occupies an attractive 19th-century building. Offering free Wi-Fi throughout, this design hotel is close to Passeig de Gràcia's exclusive boutiques. The Axel Hotel’s 500m² Spa Centre includes a hydromassage pool and saunas, and the modern rooms have flat-screen satellite TVs. The Axel’s Sky Bar features a large swimming pool, a terrace with a hot tub and a cocktail bar. Here you will find parties, art exhibitions and shows. TWO Gay Hotel Barcelona by Axel, located in the Gayxample Barcelona with its own parking in the same building, has 87 beautiful rooms fully soundproofed with the highest level of service and equipment, reflecting a comfortable and distinguished atmosphere. There is also a 24-hour reception and guests can get information on the gay scene and the city at the on-site tour desk. On the rooftop guests will also find the Sky bar, gym, steam bath and a massage room. The hotel rooms have been specially designed, equipped and decorated to create a modern and elegant environment with maximum comfort. With a careful and exquisite design, our rooms offer king size beds, TV LED HDTV, universal smartphone chargers, complete soundproofing, free wi-fi and bathroom Axel amenities. All rooms have natural light and different views depending on their orientation. A buffet breakfast is available and free high-speed WiFi access is provided throughout. * Seasonal prices may apply. The price above based on two persons sharing one standard room in EUR. If you prefer a single room on your own, please pay single room supplement. Web Page © Happy Travel, Ltd. Logos and Images © Atlantis Events Inc., Rainbow Barcelona Tours, etc.